The clock is ticking on the city’s review of a trio of large residential towers in Lower Manhattan’s Two Bridges neighborhood. On Monday, a City Planning Commission committee certified the application submitted by developers that would create over 2,700 housing units, but also moved the review process to the fall. JDS Development Group is planning a 79-story tower at 247 Cherry Street, and a joint venture between L+M Development Partners and CIM Group are building a pair of 62- and 26-story towers at 260 South Street. Starrett Development is also planning a 62-story building at 259 Clinton Street. Each of the projects will feature an affordable housing component. Ryan Singer, senior director of Land Use Review & Commission Operations, said a 60-day referral period would set the public hearing to Sept. 5 — but the body wouldn’t be able to hold a hearing until mid-October due to a packed schedule. 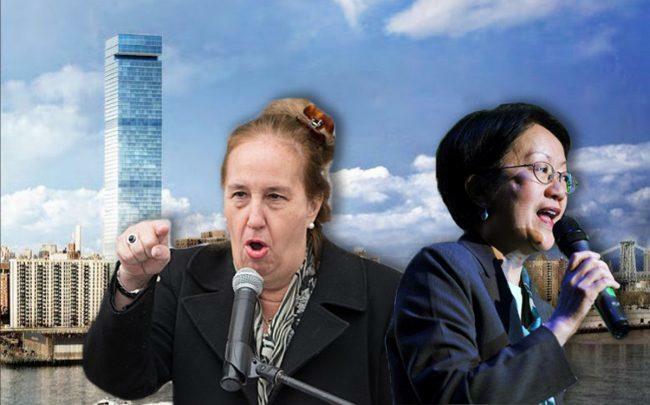 Council Member Margaret Chin and Manhattan Borough President Gale Brewer, who led a protest earlier on Monday, have pushed for more time to review the environmental impact statements, Politico reported. Critics have said the developments — were being rushed through and had not been given enough time for review. Earlier this year, Chin and Brewer proposed a zoning text amendment that would require certain projects in Two Bridges to receive a special permit — a process that could drastically slow development planned in the area. Opponents of the project have argued it would crowd an already dense area and further strain infrastructure.